Aztek Scooters takes pride in developing the most advanced scooter components. 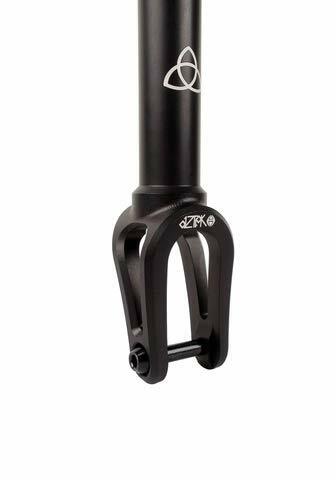 The Aztek Anthem fork utilizes a special 7075-T6 alloy which is much stronger than conventional 6061 alloy. The Anthem fork removes all unnecessary material and distributes stress to make it extremely strong, all while being the lightest fork on the planet at .474 lbs (215 g). The top of the forktube has weight-saving cutouts and is threaded for HIC and SCS compression. If you have any questions about this product by Aztek, contact us by completing and submitting the form below. If you are looking for a specif part number, please include it with your message. Lucky SILO Bar Black, 26" x 24"